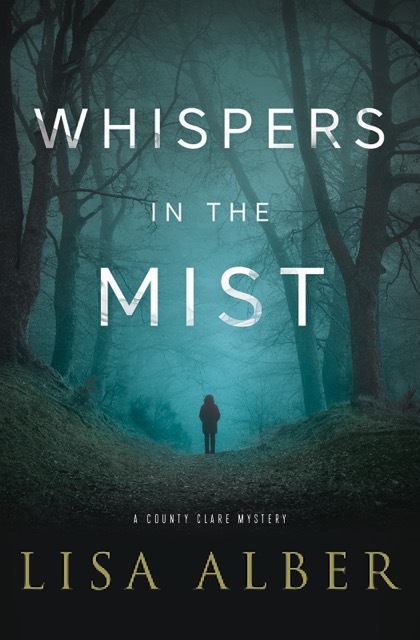 SUSAN ELIA MACNEAL: Today I'm delighted to introduce Lisa Alber, author of Kilmoon and her just-published Whispers in the Mist. LISA ALBER: Thanks for having me, Susan! I always enjoy joining the Jungle Reds gang for a day. In my relatively short time as a novelist (my second novel, WHISPERS IN THE MIST, came out a few weeks ago—woohoo! ), I’ve come to the conclusion that reading is a conversation we have with ourselves; how we react to what we read isn’t so much about the story as about ourselves. I hadn’t thought about this until I went to Ireland this past spring for novel research. 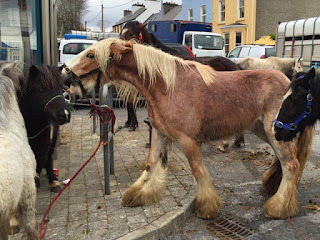 One day to my delight I happened on a big horse fair and got to talking to the owner of a Connemara pony. He was charming fellow, one of the loquacious Irish. I wasn’t expecting anything out of the conversation, but then he asked my name, and I asked his name, and then my mind got blown. “Wait,” I said, “you’re W—D—, the matchmaker?” I couldn’t believe it. 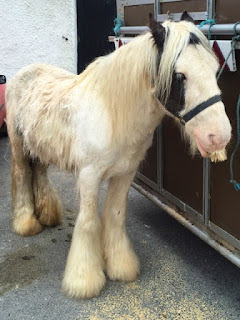 Of all the horse owners in all of Ireland, I happened to be talking to the man who was one of the inspirations for my first novel (and thus the series). Oh. My. God. 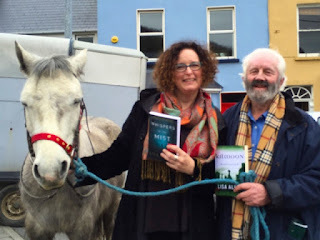 I immediately fell into a flurry of words, telling him about the County Clare mysteries and assuring him that my rendition of matchmaking had nothing to do with reality. I pulled out a copy of KILMOON that I carried with me everywhere. He seemed a little—bemused? Wary? Skeptical? But, also curious. Maybe a smidgen impressed. So, feeling a tad foolish, I signed over the copy to him. He asked for my phone number. Sure, why not? I thought. Fascinating, I thought. W—D—, matchmaker, was or is a total player. Huh. Whoa! I hadn’t expected to hear from W—, and here he’d read the bbook surprisingly fast. The next day we met up at Ginger Lou’s. Only now I was unaccountably nervous. My matchmaker is the only character I’ve written who is remotely based on reality, and however remotely, the fact remained that I’d gotten the idea for him from W—D—. If W— was a tricky character, did he want money? If he was an old gigolo, did he want—something? The next day, W— was charming as could be as we sipped tea and ate dessert (with Lou smirking in the background). He didn’t say much about the novel, only that I certainly “can write.” We chatted about all kinds of things, including his large extended family, many kids, and grandchildren. I couldn’t figure him out. Merrit is one of my series protagonists. She’s from California and is the illegitimate daughter of the local matchmaker. It took me a second to realize what W— was asking: Was Merrit based on ME? Was I his daughter? Whoa! Without letting on that I understood what he was really asking, I assured him that she’s not based on anyone real. You can see why I got to reflecting about the meanings our stories can have for people, meanings that we could never in a million years predict, meanings that don’t reflect the stories themselves, meanings that have nothing to do with us, the authors. It’s an amazing thing, not to mention a little mind-boggling. Ultimately, I suppose that’s why storytelling is so powerful. Stories have their own lives. I just hadn’t considered this for the stories I write. I mean, I’m just doing my thing—having my own conversation with myself as I write. SUSAN ELIA MACNEAL: Lisa, wow, what an amazing story. He must have been completely freaked out that you might be his real-life daughter, based on Merrit! Reds and lovely readers, when you read, how much of yourselves to you bring to the book? Do you think novels are a collaboration between writer and reader? Tell us in the comments! In Lisfenora, Ireland, a strange fog has rolled in off the Atlantic. Along with the fog comes tales of the Grey Man, a predatory faery of local lore who snatches innocent souls into his deadly gloom. When a teenage boy dies in Detective Sergeant Danny Ahern’s arms, Danny finds himself pursuing his own grey man, a killer who becomes more elusive the closer Danny gets to the truth. A mute woman may be the key to solving the murder and helping Danny heal his own broken life, but first she must unlock the memories from her past. 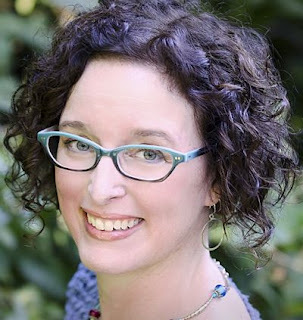 Lisa Alber writes the County Clare mysteries. Her debut novel, Kilmoon, was nominated for the Rosebud Award of Best First Novel. Kirkus calls her second novel, Whispers in the Mist, a “worthy successor to Kilmoon in tone, mood, complexity, and keen insight into human failures and triumphs.” She balances writing her third novel (Midnight Ink, August 2017) with gardening, dog-walking, and goofing off. She lives in Portland, OR. You can find Lisa online at lisaalber.com, Facebook and Twitter. I think stories must speak to the reader in a personal manner, that they must touch some part of the reader in a unique way, so in that regard I suppose books are a collaboration between writers and readers. Drawing readers into the story in a meaningful way would seem to require readers to bring something of themselves to the book. It’s always a treat to find a writer whose stories have that ability to speak to the reader in some special way . . . . It's such a small, fascinating world, isn't it? It's probably impossible to run out of stories. I never thought of reading as having a conversation with myself so much as with the author and her characters, but you've given me a fresh perspective, Lisa. What a delightful story and W D looks like a delightful, glib tongued, Irishman! Can't you just imagine him coming to the conclusion that you might be his daughter! I never thought of reading as a conversation between the reader and the story, but of course, it is. There has to be a touch point to hold interest. Looking at the books on my shelf though, it's scary to think they say something not only about the author, but amount me. Time to hide the Jack the Ripper collection. As a writer, my stories are a definite conversation with the characters. They shape the ebb and flow of the story and keep me honest in their eyes which makes them honest to the reader. So yes, I never thought of it, but it is a circle of words. A fabulous story, Lisa. Readers certainly bring their own stories to our. I've had fans they knew something about a particular part of a book and I can only smile and say, "Interesting." Because that had never occurred to me! Welcome, Lisa! Such a great story! I use lots of real mixed in with imaginary in my books. And yes it makes total sense that each reader brings his/her own history to the book and sees and feels things that others might not see. What a complicated world we spin! Love your story, Lisa. SO often something really happens and eventually it gets into a book. Magical when that happens. These days I have to be sure to write it down or it vanishes into the "mists" of time (my brain). And so amazing how thing that happen in real life would NEVESR be a believable scene in a book. You just HAPPENED to meet this guy? Sure. But in real life, we all easily believe it. Congratulations, Lisa! I read and enjoyed KILMOON, so I suspect I'll enjoy WHISPERS IN THE MIST. Because I loved Danny's character and wanted to know more about it. I think readers definitely bring their own experiences to a story, which allows them to get meaning out of it that the author may never have dreamed of. Isn't that what powers so many English literature classes in college? LOL I bet Jane Austen or William Shakespeare never imagined that so many people would read, study and discuss their works for so many years. Old Will was just trying to entertain and make some money. I don't know if I am in my books as much as my characters are the people I would like to be - but can't be for some reason or another. They certainly share some of my values. And I do have conversations with them. Hmm. Food for thought the next time I sit down to write. Lisa,it's been my experience that encounters like this happen in Ireland. It really is a nation of CHARACTERS, none of them boring. This is a great story. Good luck with the book. Now I want to go to Ireland! Lisa, where's a good first place to go, for those of us who've never been? Lisa, what a great story!! And he does look a charming character, doesn't he? From years of listening to readers' comments, I do believe that readers have their own conversations with books, and that as often as not, not what the writer intended! Lisa, you are so right about readers bringing their own experience into the book. I want Scott a very angry review from someone I later found out had been censured for dating within her own congregation. That didn't happen in my novel, but she brought her own experience into it and, essentially, read what wasn't there. And I will echo Hank: however did you find out about W-- D--? ARG. That was "once got." I'm still breaking in my voice recognition software. Joan: I totally agree. Readers do bring themselves to the books they read. Reading reviews, such as those on Amazon, is truly enlightening. I don't take the meh reviews personally--how can I? The review is about the reviewer, really. Karen: I also think of writing as a conversation with myself too. My characters talk to me, but really, I'm talking to myself on some deeper level. Edith, another fascinating thing is which characters readers prefer. That says a lot about the readers too. Susan: Thanks for inviting me! Hi Roberta: Sometimes I can't believe that I write fiction, period, much less that my stories might hit cords with readers. Even the negative cords are OK! Hi Hank, I know! I could never write that kind of thing into a story, never! I'd be relying on coincidence, right? And we're not supposed to do that. On my first trip to Ireland eons ago, I happened on Lisdoonvarna, home to the real matchmaking festival. The locals like to talk about Willie Daly, so that's how I learned about him. I'm so happy to see Lisa here today on my favorite blog. I finally read Kilmoon this summer, and, luckily, it was only a couple of weeks before Whispers in the Mist came out. I loved both books, and I've so enjoyed getting to know Lisa some, too. 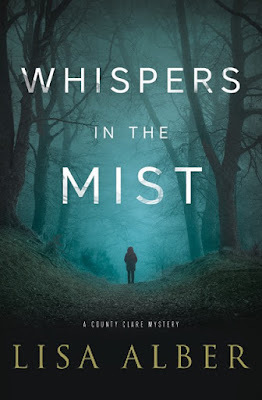 I featured Whispers in the Mist in a review on my blog, and Lisa and I are trying to get together for an interview, too. The brilliant descriptions in these books have made me want to go to Ireland, too. I already am trying to plan a trip to England and Scotland, and, now, Lisa, you have made Ireland irresistible. What a great story about meeting the matchmaker, Lisa! As they say, you can't make this stuff up. I think you must have had the luck of the Irish sent your way on that one. And, that he thought you might be his daughter? You handled that so well. I think it's fairly easy to imagine that an author is communicating with you as you read his/her book, as in pointing out something that you respond emotionally to or realize is a "moment" for you. And, we all bring our own experiences and expectations into reading, so each person responds in a very personal way to a book, even though there are, of course, general responses in common. Mary, thanks! So true about English Lit classes. :-) Or in book groups! Oh my god, I remember some heated conversations. It was like we'd read different novels. HI Susan, I'd say a good first place to go for people who've never been is the southeast. Ring of Kerry, Dingle Peninsula. Gorgeous! Hi Debs--such a charmer, wow is he. Takes it to a new level. Scotland is so hot right now--I'm not surprised that your agent suggest Scotland instead. Seems like everyone's got Irish relatives ... Could Gemma or Duncan have family there and something happens ... ? Readers involved with books? Oh my. Right now I am reading a novel that is part mystery, maybe part ghost story and totally terrifying. I am so involved with it that I can only read for a short while before taking a break. Before my brother-in-law fractured his heel last weekend, we had planned a trip to Three Pines over the holiday. Oh yeah. I get involved. It isn't on any map. (Smile). But I bet we can find something close. I read Whispers in the Mist in one sitting. Fabulous book! Best of luck with it. HI Laura! Thanks and looking forward to reading your next! Hah! Having read the book, I can imagine what was running through his mind. Great story. Wonderful encounter! I love that he made the leap from knowing that a character was loosely based on himself to making the assumption that all the characters are set using the same degree of reality. As a writer I often worry as I constantly pinch and repackage little incidents I experience firsthand or hear about on the news or from friends. I don't always remember the source so I guess it's possible that someone out there may see more of themselves in one of my novels than they bargained for! I'm also constantly asked if my main character is based on me which is amusing on many levels. Congratulations on Whispers in the Mist. I look forward to reading it. I just ordered Kilmoon - enjoyed the story of your experience in Ireland, and now I will read the book! Right, Susan? The poor guy must have been in agonies as he was reading it. I imagine him stewing about it, wondering if her should contact me, imagining back to American women he shagged back in the day ... :-) Meanwhile, me: Wheee, I'm having so much fun in Ireland! Thanks, Pauline! I hope you enjoy it! Lisa, I just bought Kilmoon but haven't started reading it yet. I want to read it because I've heard such good things about it. Now I'll need to get started so I can move on to Whispers in the Mist! The incident you described makes me believe you must really bring your characters to life, and I am all the more eager to get started on that book. As a reader I've wanted to visit places I read about in novels. It's not at all unusual for me to start reading as much non- fiction as I can get my hands on about a place if a novel has brought that place to life for me. What a wonderful story. That's fantastic that you met the matchmaker. It truly is a small world. Thank you for sharing your story and the pictures of the beautiful horses. Ann, thanks for clarifying. :-) I was thinking -- wait? You can find Three Pines? Maybe it's like the search for Shangri-La. Hi Deborah, thanks for the buying Kilmoon! I like to read about places through memoir. In fact, that's what led to my first trip to Ireland -- a memoir called WHOREDOM IN KIMMAGE. I fell in loved with the author's descriptions of County Clare. Thanks Robyn! I loved the horses. See the one with the mustache? :-) Cracked me up! I read your first book set in Ireland. I was reminded of a movie with Janeane Garfolo (sp). It was about a PR person who worked for a Boston politician. She thought he was Irish so she went over to Ireland to try to trace his Irish roots. She arrives during the matchmaking festival. it was hilarious. Turns out the politician did not tell his PR person that he was not Irish. he admitted that his grandfather came from Eastern Europe ? and picked a name from a map of Ireland.